A brand new 80-ton Man Diesel trailer with the capacity to transport earth moving machines and heavy equipment has been acquired by the Facilities Management Services (FMS) at IITA, Ibadan, to support the activities and operations at the Institute. This new addition will facilitate haulage jobs and also improve efficiency of handlers of heavy equipment. 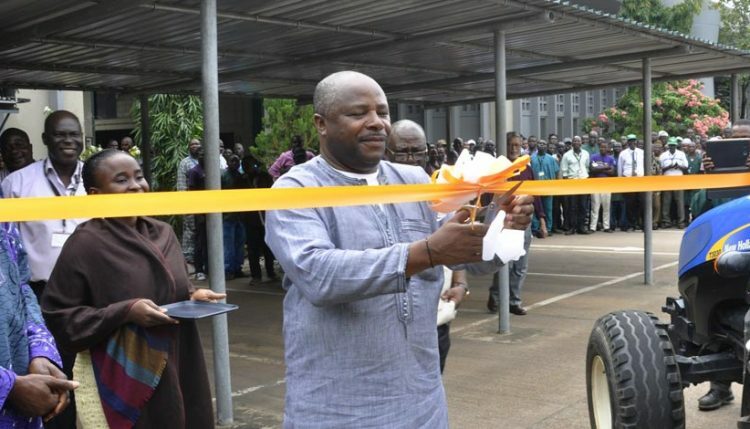 The machine was commissioned by DG Nteranya Sanginga in the presence of management, staff, and scientists on 5 August. “This new 80-ton, low-bed trailer is safety compliant and will serve other IITA users, within Nigeria and beyond and is expected to significantly reduce FMS’ operational costs and increase the unit’s productivity level,” said Waheed Quader, Head of FMS. Speaking to the staff, DG Sanginga said he was pleased to commission the equipment. He implored IITA staff to take care of IITA and its facilities. “Take care of IITA and IITA will take care of you,” he said. DG Sanginga also advised staff members to be determined and disciplined and assured them that the next five years will be better. Kwame Akuffo-Akoto, Deputy Director General, Corporate Services, also commended the unit and encouraged them to continue to work hard. Quader and Martins Akeredolu, Deputy Head, FMS, pledged the unit’s commitment to continue improving on its services, and wished the DG a happy second tenure in office. FMS welcomes patronage from users of haulage services while assuring that the tariff for this service will be competitive, and the transport safe.